White ceramic house to use as a decorative tealight. Shop online for more modern Scandinavian design gifts. Visit our store in Amsterdam. Porcelain tealight holder "Canal House". Shop more modern design home decoration and gifts in our online store. 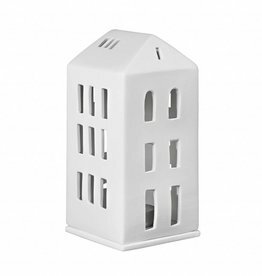 White ceramic tealight holder in the shape of a house. Shop more modern design home decor and gifts in our online store.